Each week many issues present themselves as subjects worth a columnist’s attention. The past week has been unusual in the number of important and newsworthy things that have happened. Rather than saying a lot on one issue, permit me today to say a little on many. “The right to one’s good name” is a phrase used in Ireland almost infinitely more frequently than in other countries. The emphasis placed on it in Irish society may explain why the country’s libel laws are so strict. It may also explain why there is so much opposition to parliamentary committees doing what they do in other countries and why judicial encroachment into the operation of these committees goes unopposed. In 2011, a British parliamentary committee put 418 often-aggressive questions to the then 80-year-old media tycoon Rupert Murdoch – both before and after he was physically attacked by a pie-throwing prankster. The committed made a finding that Murdoch was “not fit to lead a major international company”. Neither Zuckerberg nor Murdoch went to the courts over the treatment they received at the hands of politicians. Angela Kerins went to the Irish courts following her questioning in 2014 by a Leinster House committee about the use of tens of millions of euro of taxpayers’ money by the charity that she then led. Zuckerberg and Murdoch did not go down that route because courts in the US and the UK understand that no system of accountability is perfect and, more importantly, they know that it is not for the judicial branch of government to breach the separation of powers and encroach into the affairs of the legislative branch of government. In the first part of the Kerins judgment, delivered in February, Ireland’s (unelected) supreme court gave itself the right to tell (elected) parliamentarians what they can and cannot do in committees. The chilling effect of this judgment was already evident last week when senior members of the FAI got excessively soft scrutiny. The ‘key findings” of the Policing Authority’s latest assessment of Garda reform, made public last week, made for mostly depressing reading. A litany of basic failings gave little reason to believe one of the State’s most important institutions is moving away from dysfunctionality with any alacrity. Two other developments last week underlined the seriousness of the force’s inadequacies. The State’s statistician-in-chief, Padraig Dalton, told the Public Accounts Committee that the Central Statistics Office (CSO) could not fully stand over crime statistics because it could not be sure the raw data it received from gardai was accurate. A few hundred metres away in Dublin Castle, the second module of the Disclosures Tribunal began. It will look into how a new batch of gardai who made allegations of misconduct were treated after they did so. It will run for many more months. Public trust in the force does not appear to have been significantly eroded by scandal after scandal. But patience wears thin. Single straws can break a camel’s back. There is a real danger that the force is just one more scandal away from having its legitimacy seriously undermined. Everyone who thinks Brexit is a bad idea can be grateful that sense prevailed at last Wednesday night’s summit of European leaders, and that we are not experiencing a border crisis and trade disruption this morning. The Brussels meeting did not go off the rails, even if there were real disagreements about giving the British more time to reach a consensus on their departure from the EU. The exit time frame has been pushed out until the end of June, if European Parliament elections are not held across the UK, and the end of October, if they are. Despite these developments, nobody is out of the Brexit woods. The Irish backstop – without which Britain would have already exited smoothly into a transition period over two weeks ago – remains very unlikely to be swallowed by the British in the coming months. Further turmoil seems much more likely. 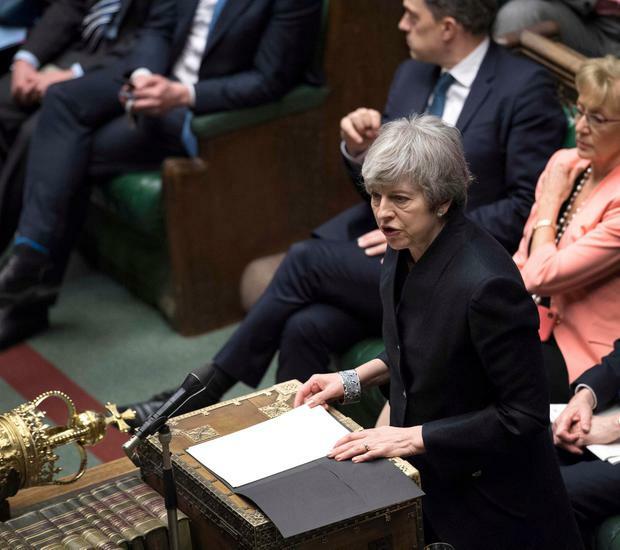 A no-deal exit remains a distinct possibility unless something big happens in British politics that brings about a consensus. From Brexit to bread and butter. Figures published by the CSO last Thursday show some modest easing in rent increases, with annual rises coming down from over 10pc two years ago to a little over 5pc in March. That said, rent inflation remains far above overall consumer price inflation and above average earnings growth. When compared with the rest of Europe, Irish rents have risen by 27pc since 2015, more than in any other of the 28 members of the EU. More homebuilding is one reason for the recent modest moderation in rent inflation. That trend looks likely to continue. Another factor in making renting less unaffordable is much stronger wage growth. With an immediate Brexit shock out of the way, for a few months at least, earnings growth should continue apace. Cold comfort it may be right now, but the day when pay and rent increases move into line is coming into sight. Last week brought better news for those seeking to buy homes than for those renting. Thursday’s CSO figures showed that property prices outside Dublin stayed perfectly stable in the six months to February. In the capital, where housing supply is tightest and costs far higher than elsewhere in the country, prices fell in February, the fourth consecutive monthly decline. There has not been an unbroken run of declines of that duration since the crash period of 2007-2012. This recent trend should not, however, be over-interpreted, particularly as the period of stable/falling prices included the months around Christmas when property prices often slump. Nor is a new era of long-term alignment between property prices and the wider consumer price level likely to be at hand. All that said, an increase in the supply of new homes and tighter post-crash rules on lending are having their effect on calming the market. Last week brought good news for homeowners on variable rate mortgages. On Wednesday the European Central Bank chief, Mario Draghi, announced that interest rates were likely to stay at rock bottom until next year at the earliest. Previously, Frankfurt had signalled that the first rate increase in almost a decade would come in the second half of this year. If that is good for borrowers, it is not good for savers, who continue to earn next to nothing on their bank depositions. However, the reasons for the ECB to hold back on raising rates should concern everyone. The eurozone economy was weakened over the past year, for a range of not always well-understood reasons. Draghi and Co believe that ultra-cheap money is the sort of medicine the faint looking euro-economy needs now. Hopefully, the medicine will work and the malaise will be fleeting. The last thing anyone needs now is another euro crisis.